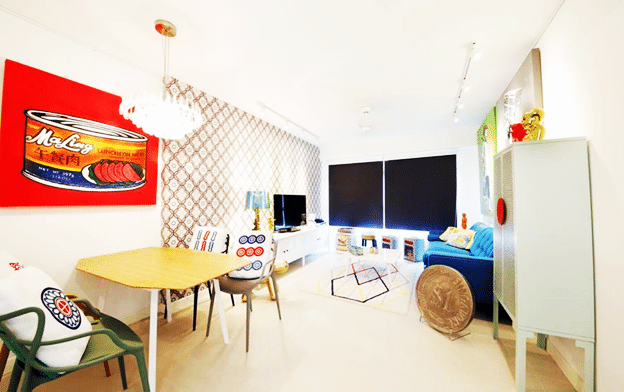 Every space serves a particular purpose in a house. A house is like a beautiful musical composition where each room has its own space in the overall melody. TV lounge is perhaps the biggest and most important space in any house. It is a space where families spend quality time and enjoy lazy evenings. Below we share some amazing Lounges that would inspire your own beautiful space. Colors are spice of life; they add beauty, elegance and uniqueness to the interior. This beautiful lounge has a ton of space that it utilizes to perfection. The expansiveness of the interior makes each element in the room shine with perfection. 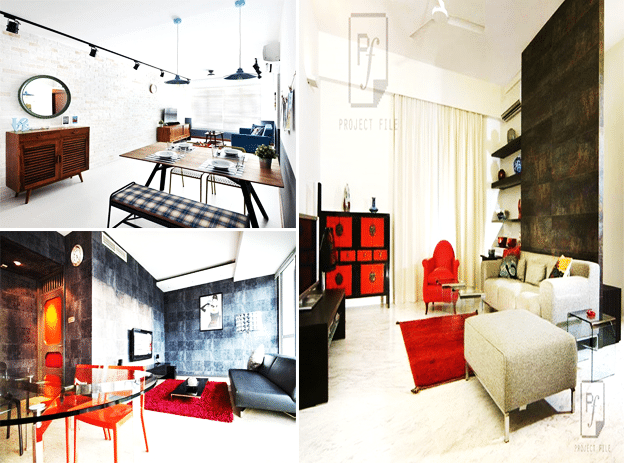 The beautiful array of colors and patterns scattered across the walls make the space shine with life and perfection. The beautiful arrangement of furniture in the room creates a stunning impression. This is a beautiful TV lounge with a ton of beauty and elegance. Simplicity and minimalism has an innate beauty that is unmistakable. This beautiful TV lounge does not confuse the eye with clutter but rather elects a clean and crisp look. The beautiful textured marble has an elegance that is absolutely stunning. The single and beautiful couch sits proudly in the middle guarded by beautiful space around it. 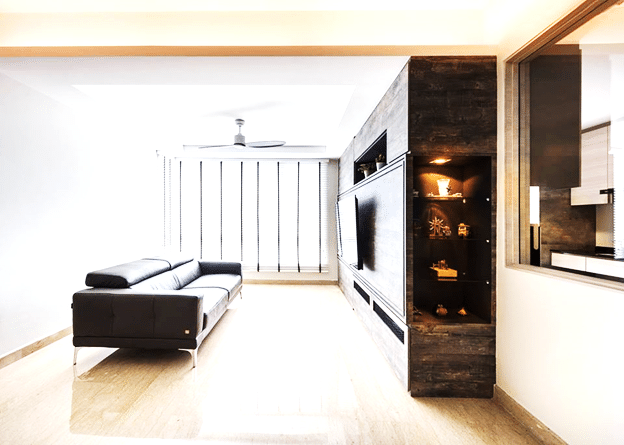 The elegant Wooden wall present the perfect display space for the TV. This is a simple, clean and beautiful look. It is a common practice to integrate a dining space in the TV lounge. The combo of these two spaces works perfectly together. 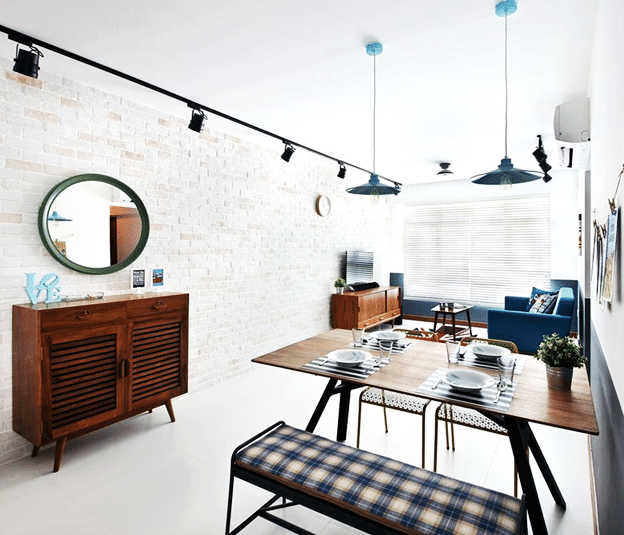 The beautiful brick wall presents a perfect backdrop for the decoration of this interior. The elegant dining and beautiful TV lounge combine in an intricate fashion creating a perfectly beautiful space. This amazing space combines beauty, elegance and intricate beauty in abundance. This is a truly inspirational design for your home. This design also adopts a combo design where it combines a dining space into the TV lounge. This beautiful interior has all the unique elements that any interior needs to make it perfect in all respects. The luxurious mat sitting in the middle serves as the focal point of the room which attracts the eye. The textured wall creates a new layer of beauty and elegance into the interior. 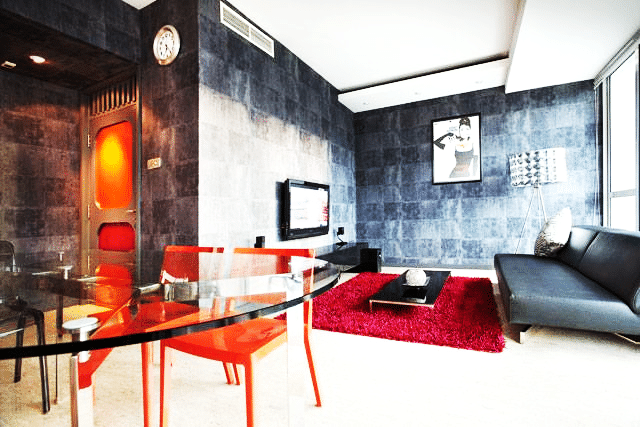 This interior is colorful, beautiful and packed to the brim with perfection.